This blog comes from A. Panquang, a member of Freed Voices (@FreedVoices) and Detention Forum volunteer. 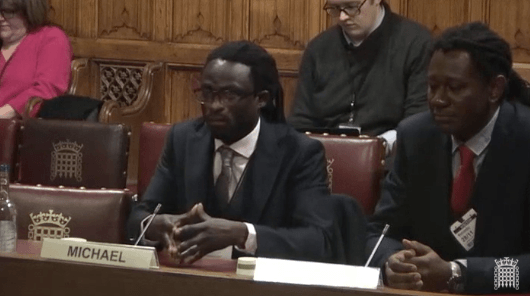 On 28 November, A gave evidence to the Joint Committee on Human Rights’ inquiry into immigration detention alongside Michael, another member of Freed Voices. I have never given evidence in Parliament before. The first thing that I noticed was that it was a normal activity for the Joint Committee. I guess I was expecting more. To prepare myself to give evidence I read some of the other evidence that had been given to the JCHR before mine. To call these people experts is not completely misleading, because they are experts in their respective fields, but none of them know what it’s like to experience detention. 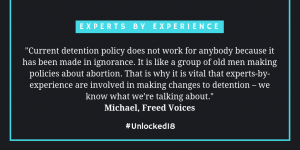 We from Freed Voices are experts by experience. If anyone needed to understand about the inhumane conditions in immigration removal centres (IRCs), if anyone wanted to get a clear picture of the violations of Human Rights, they should be speaking to Freed Voices – Experts by experience. You can watch the whole interview online. First of all, I am grateful that an inquiry has been organised to deal with the situation in UK IRCs. I hope the evidence we gave can influence the Immigration Bill coming out next year. We were told to express ourselves as best as we could, to cover every subject we wanted to cover. We did our best to make our suggestions and tell our stories; our experiences. Most of what we said seemed to be news to their ears, because it wasn’t what they expected. I felt the questions they asked were target orientated – mainly about legal support given to people in detention. They were interested in how we were detained, if we felt fairly and justly treated, if we had adequate legal advice and representation, and if we received ample warning before being detained. The truth is although many of our experiences are similar, no two people have the same story. No two people feel the same way about their immigration situation. What was obvious was how inhuman the conditions were and how the incompetence of the Home Office affected us. 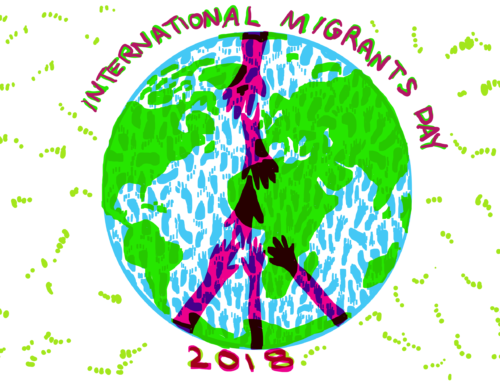 Detention centres are meant to facilitate transition, but most of the privately-run IRC management teams use IRCs to make profits and marginalise the humanity of those in detention. My fellow member of Freed Voices had much more to say, because he had more experience and had been dealing with this longer than myself. So I was happy to let him take the lead. I added what I thought could fortify our evidence. We don’t want what we went through to be a story to tell friends, family and community just for the sake of telling a story. We want our experiences to help people make changes, to better the immigration process and system for people who are experiencing it now and in the future. Ideally we want these detention walls to fall, we want a time limit, but most of all we would like to start by demanding better and more humane conditions for people in detention at the moment. If I had to make any recommendation other than what I suggested during the evidence giving process, it would be for such a committee to interview Freed Voices earlier in the process. The disadvantage of giving evidence so late meant the questions from the committee to us were already impregnated with theoretical and imaginary information. The truth about the practical, day-to-day experience could only be gathered from experts-by-experience. Questions should have been coming from our narration, not the other way round. At this point in time, I cannot comment on the outcome. I don’t know how much of my evidence will enact change, I don’t know how much of our information will be used. I am hopeful that what we gave as evidence is taken into consideration. When Freed Voices are described as ‘former detainees’, I think this does us a disservice. This title brainwashes people from the reality. There are millions of people who still have an ill-conceived idea of detention: ‘detainees’ are bad, they are a danger to the community and they should be locked up. Yes, we are ‘former detainees’, but we were people before detention and now that we’re Freed Voices members it means we are no longer in detention. The stain of detention will haunt us for the rest of our lives, but I don’t want it to define us. Our true title is ‘Experts-By-Experience’ not former detainees.